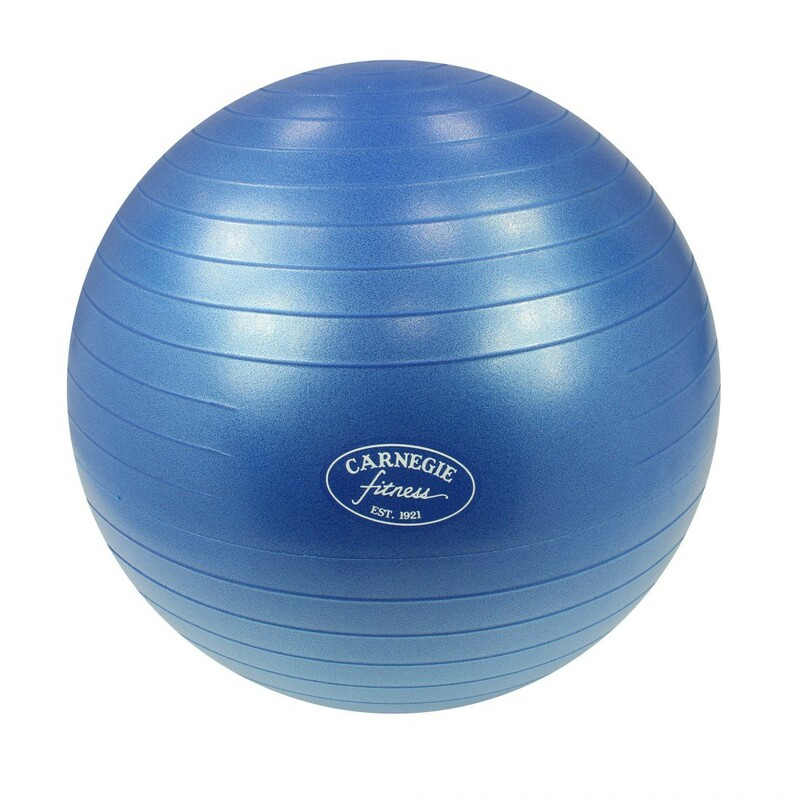 Buy Carnegie Maxiball 55 - Gymnastikball, Sitzball, Fitnessball inkl. Pumpe, Ø55 cm, Anti-Burst-System max 300kg from Carnegie Fitness at Camping Outdoor online. This high-quality ball offers an excellent variety of exercises for young and old, beginners and advanced players. Light training sessions quickly lead to a better sense of balance, improve coordination and strengthen the trunk muscles. In addition, abdominal muscles, hips, legs and gluteal muscles are trained. This sports equipment is indispensable for training at home - it is used for aerobics, pilates, pregnancy gymnastics, physiotherapy, fitness training and abdominal muscle training. Due to these versatile applications, the ball can be used as a substitute for the gym. The all-rounder made of environmentally friendly material can of course also be used as an office chair - here too, the back is strengthened permanently while working at the desk and the spine is stabilised. The gymnastics ball is resistant to 300 kg bursting and produced without any toxic chemicals. 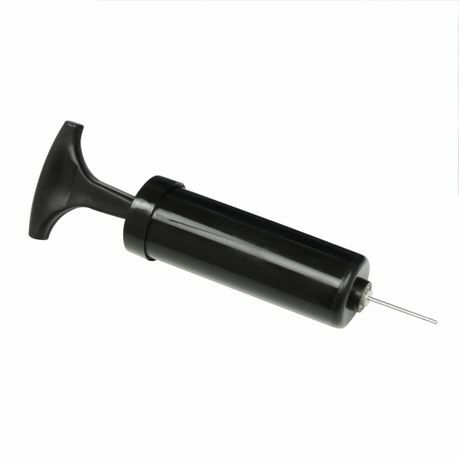 A practical ball pump is included in the scope of delivery, so that the fitness equipment is ready for immediate use. If the air is drained, it fits in every baggage and can also be used without complications on holiday in the hotel. The blue ball has a diameter of 55 cm - it is particularly suitable for people up to 1.73 m tall. The workout with gymnastic balls is varied and easy on the joints. With the right exercises almost all body regions can be strengthened - back pain can be prevented and the balance can be trained. The muscular centre of gravity during training with fitness balls lies in the core of the body - straight and oblique muscles are strengthened and the entire body is strengthened. With the right exercises, your own living room can replace the gym. The ball also serves well as an office chair and strengthens the torso muscles during office work. Beginners and advanced learners alike get their money´s worth - intensity and level of difficulty can be varied individually and the personal training plan can be developed in a targeted way. Included in the delivery is a poster showing many exercise variations. Made of environmentally friendly, skin-friendly material in first-class workmanship. The colourful ball is equipped with the anti-burst system and can hold up to 300 kg! Due to the hard-wearing and highly stable material, the ball needs a little time to stretch to its full size. The material is durable and enduring and ideal for sports lessons. 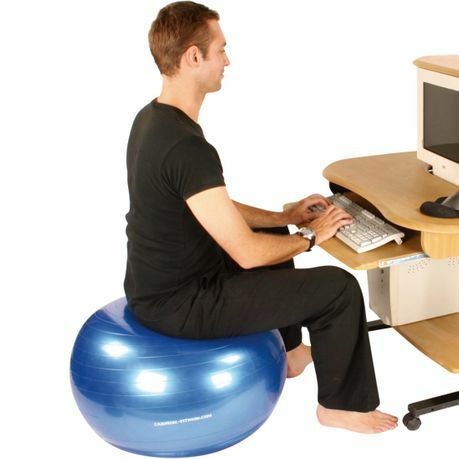 This ball is ideal for back problems and is a pleasant seat also in the office. A ball holder is included in the accessories and prevents rolling away. Hygiene und Sauberkeit, kein Problem! Der Ball wird einfach mit Wasser und einen Tuch gereinigt. Stärke Verschmutzungen können mit einer leichten Seifenlauge entfernt werden.